Liam Gallagher has been berating his brother on social media since Noel Gallagher's High Flying Birds enlisted a scissors player for his appearance on Later… with Jools Holland last week, but the younger sibling just upped his troll game even further. After Liam jokingly (or so we thought) put out a call on Twitter for a live potato peeler, a devoted fan actually showed up to Tuesday (November 7) night's Bethnal Green gig with a spud and a peeler in hand. 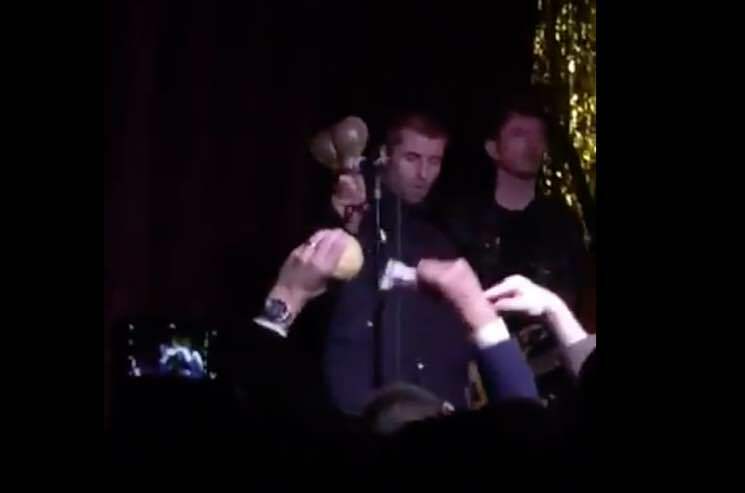 While the rock'n'roll star shook maracas onstage, the audience member shredded potato skin all over the front of the crowd. Liam had previously joked about hiring a banana peeler, pencil sharpener and a sticker sticker, but given his favourite insult for Noel, the potato peeler seems like the best fit. The former Oasis singer even returned to Twitter to show his appreciation for the enthusiastic fan, calling him "truly out there," before adding in a complimentary "psychedelic even." Watch hilarious footage of the live potato-peeling accompaniment below.